This transceiver was designed for home and portable operation. The name of this radio is "The One Watter" or "1Watter". The Xcvr has low noise and is very sensitive and selective. The VXO covers both sides of the standard QRP CW calling frequencies. and appreciate his help testing it to remove all the bugs and bad smoke. Do not mix up the toroids between the plastic bags. Keep all toroids in their plastic bags until called for installation. Do not mix up the blue 1N5711 signal diodes with the blue NPC-127 zener diodes. The 1N5711 signal diodes are taped together and the zeners are loose. If you are missing any parts, contact me immediately. I will ship the parts the same day. If you find extra parts in the kit, check the Addendum else throw them in your junk box. This kit includes all parts to create a functioning transceiver EXCEPT the tune pot. Included parts are: 2 phone jacks, a bnc jack, a push-button, volume control pot, magnet wire and heat sink. This kit uses several all black ferrite toroids. One (1) FT37-43 and multiple FT37-61 toroids; they look the same. The FT37-43 is included in the bag with the SMT capacitors. Mark the bag with the SMT caps as "-43" and the bag with the resistors as "-61"
This will help with identification later on when installing inductors and transformers. Install the parts in the order per this document to prevent mechanical installation problems later. The Serial Number may later be used for tracking 1Watter QSO contests. hook-up wire/coax to connect the PCB to the chasis and an optional power on/off switch and optional case. These capacitors are easy to install, especially if you have some kind of part holding/positioning tool. 3. Install all 1/8 Watt Resistors. You will need a magnifying device to verify the resistor color codes. Bend the resistor leads a sharp 90 degrees from the body of the resistors. R20, the volume control will be connected later. Save 5 cut resistor leads to ground the crystal cases later. 4. Install all Diodes - observe polarity. 5. Install all IC sockets - observe polarity. 6. Install all remaining capacitors in the order shown. Do not install Q1 at this time. Measure the output voltages of U1 (10V), U-7 (8V) and U-8(5V) to make sure they are correct. Measure the output voltage of U3 (8V) to make sure it is are correct. Remove the clipped resistor lead and remove the power source and continue with parts installation. 8. Install all five 8-pin DIP ICs. 9. Wind and install all Toroid Inductors. Wind all wires on the toroids clockwise. Cut two 13" pieces of #26 red wire. ____L1,2: Wind 17 turns of #26 red wire on the T37-2 red toroid, tightly spaced. Trim the wires of L1 and L2 to a half inch each. Tin & Strip the insulation to the base of the toroid using a hot solder pencil. Cut 19" of #30 red wire and 6 inches of #27 green wire. ____T4: Wind 30 turns of #30 red wire on an T37-2 red toroid, tightly spaced. Trim the #30 wires of T4 to one inch. Wind 4 turns of #27 green wire on the T37-2 red toroid, tightly spaced. Trim the #27 wires of T4 to a half inch each. Cut 8" of #26 red wire and 4 inches of #27 green wire. 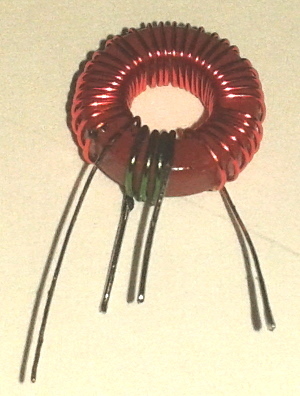 ____T2: Wind 7 turns of #26 red wire on an FT37-61 black ferrite toroid, tightly spaced. Trim the #26 wires of T2 to one inch. Wind 1 turn of the #27 tinned wire on the FT37-61 black ferrite toroid. Cut 19" of #30 red wire and 4 inches of #27 green wire. ____T3: Wind 32 turns of #30 red wire on an T37-2 red toroid, tightly spaced. Trim the #30 wires of T3 to one inch. Wind 2 turns of the #27 green wire on the T37-2 red toroid. Cut 9" of #27 green wire. ____L4: Wind 10 turns of #27 green wire on an FT37-43 black ferrite toroid, tightly spaced. Trim the wires of L4 to a half inch each. Cut 9" of #26 red wire and 4 inches of #27 green wire. 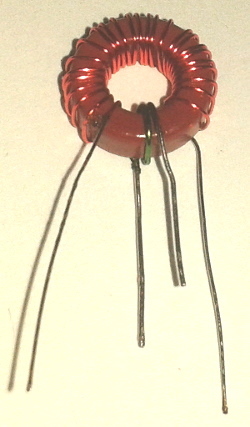 ____T1: Wind 10 turns of #26 red wire on an FT37-61 black ferrite toroid, tightly spaced. Trim the #26 red wires of T1 to one inch. Wind 2 turns of #27 green wire on the FT37-61 black toroid, tightly spaced. Trim the #27 green wires of T1 to a half inch. Cut 14" of #26 red wire. ____L3: Wind 20 turns of #26 red wire on an FT37-61 black ferrite toroid, tightly spaced. Trim the wires of L3 to a half inch each. Cut 13" of #26 red wire. ____L6: Wind 18 turns of #26 red wire on an T37-2 red toroid, tightly spaced. Trim the wires of L6 to a half inch each. 9.9 Install inductor L5. 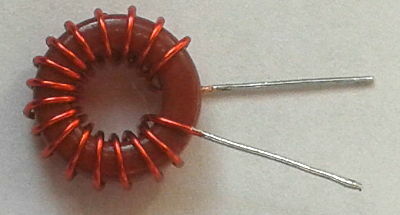 This inductor determines the upper and lower frequencies of the 1Watter. Cut 18" of #27 green wire. ____L5: Wind 27 turns of #27 greeen wire on an T37-2 red toroid, tightly spaced. Trim the wires of L5 to a half inch each. Cut 10" of #34 red wire and 4" of #30 red wire. ____T5: Wind 8 turns of #34 red wire on an BN-43-2402 black ferrite binocular. Trim the red wires of T5 to one inch each. Wind 2 turns of #30 red wire on the BN-43-2402 black ferrite binocular. Trim the #30 wires of T5 to one half inch each. Tin & Strip the insulation on all 4 wires to the base of the binocular. The #34 wire leads for the 8 Turn winding go to the two pads closest to the IC, Pins 1 and 2. 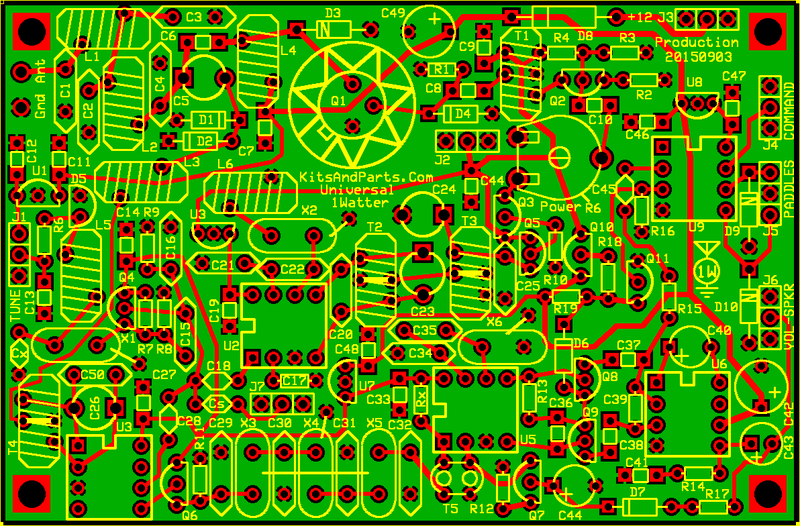 The #30 wire leads go to the two pads farthest away from the IC or toward the bottom of the PCB. Install T5 into the PCB, pull the leads tight using needle nose pliers, solder and trim. There are 5 pieces of 16.000 mHz crystals included in the kit. These crystals are graded for frequency and resistance. If you find a crystal with a black dot, install it in X6. If you find 2 crystals with black dots, install in X2 & X6. The Filter Crystals X3,4,5 should not have a black dot. Do not overheat the crystals. Connect the 500 ohm volume pot (R20) using any insulated wire. Connect the volume control high side to the center of J6 on the PCB. Connect the volume control cold side to a ground on J6. 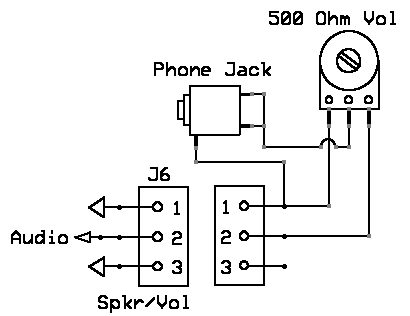 Connect the 3.5 mm phono jack ground to the cold side of the volume control pot. Connect a user supplied pot (5K or 10K or 100K or 1 Meg) to the "Tune" connector J1. Connect the tune control wiper to the center hole on J1. Connect the provided BNC connector to the "Ant" connection next to L1 on the PCB. Connect +12.6V volts (+/- 1 volt) to the holes in the upper right corner of the PCB. Connect any antenna to the 1Watter. Anything from a 2 foot wire up a large antenna. Apply power to the 1Watter and set the volume control to maximum. Adjust C5 and C26, back and forth for maximum noise coming from the speaker/headphones. If you connected an antenna, you may hear CW signals by tuning the Tune Pot. The transmit oscillator part of U2, X2 and L6 should match that frequency +/- 100 Hz. Next we will adjust for maximum carrier output. You will need a 40 meter receiver or an oscilloscope. If you do not have either, we will align the transmitter after we install the final transistor. the mixer also produces other frequencies that must be rejected. C23 has broad tuning while C24 has very sharp tuning. Preset the Tune Pot to half way or in the middle. adjust C24 to max signal on the scope or receiver. If using a receiver, you will need to hunt for the actual signal. After finding the signal, readjust both C23 and C24 for maximum signal. and C24 should be near 50 percent capacitance. frequency generated by the transmit mixer. Measure the frequency using a scope of freq counter. ____Q1 heat sink: - push the heat sink over the case of Q1; align heat sink to match PCB pattern. The sidetone volume is fixed/set by R15,2M2 & C45,33p. Connect a 50 ohm dummy load to the output of the transceiver and power up with 12V. Connect xcvr to power supply through an amp meter, 250 mA or greater. Key the transmitter and adjust R5 for exactly 250 milliamps. Ajusting C24 for maximum milliamps current. Adjust R5 to keep the current at 250 Ma. repeat several times until you know that C23 & C24 are peaked and R5 is set for 250 Ma. If you have a wattmeter, insert it between the dummy load and the tranceiver. It should measure very near 1 watt output. You may also adjust R5 for 20 volts P-P on a scope. It is recommended that you do not adjust R5 for more than 1 watt to prevent instability. This completes the 1Watter Tranceiver alignment. Too many turns and the oscillator stops working or becomes unstable. Add capacitance at Cx, between the crystal X1 and L5 and ground. Try 3-10 pF for starters. On power-Up, the keyer defaults to 15 WPM and a sidetone of 625 Hz and annunciates "1W" [ .---- .-- ] via Int'L Morse Code. Connecting a straight key with a Mono Plug automatically places the keyer into straight key mode. The internal timing oscillator in the Keyer Chip is an RC oscillator that runs at 9.6 MHz +/- 10 pct Factory Calibration. the oscillator and reprogram the keyer chip. This procedure is too time consuming for 200 chips but may be OK for you. The accuracy is typically +/- 5 pct so your sidetone may be off by +/- 5 pct and your keying WPM may also be off. That means if you set the WPM speed to 20 WPM, you may actually have it set at 19 or 21 WPM; should not be a problem. The keyer is placed into the "Command" mode by pressing and releasing the Cmd Button. The sidetone mode setting is saved on power-down. Sidetone audio is always active when a CMD is issued. "S" (for Straight Key Mode) in code. The keyer mode is NOT saved on power-down. Enter one character at a time, then wait for another "dit"
To enter a word space, do not enter anything in between annunciated "dits"
At the end of the message, do not forget to add empty character time. This allows you to pause and listen between CQ calls. Recommend between 10 and 20 word spaces. Terminate message entry mode by send "AR" or ".-.-." or "X" (for reversed paddles) in code. The paddles (normal or reverse) are saved on power-down. "S" (...) Set keyer speed in WPM. Speed is entered as two numerical digits. Depending upon what you enter, you will hear a "?" for ERROR or an "R" for a "Roger" acknowlegement. The keyer speed setting is saved on power-down. "F" (..-.) Sets the sidetone frequency. The sidetone frequency setting is saved on power-down. 64 successive DAHs, the keyer will shut down and cease to operate. You must power down the keyer chip to restart normal operation. To Reset the Keyer to the Default mode, hold the Cmd button active until you hear "1W"
Then immediately release the Command Button, else you will send another Command request. Sep 07 2015 1330 - C51 is not shown on the PCB; it is used for 160 meters only. Sep 07 2015 1905 - C44 is shown twice on the PCB; the C44 capacitor connected to D7 should be designated C52. connect a 100n axial yellow cap from C36/Q9 to ground as shown in the picture. Oct 06 2015 1254 - Added Keyer Connection Schematic to Section 11 of this Document. The 1W40 will work fine with 18 trurns on L6 but may be better with 17; TBD. 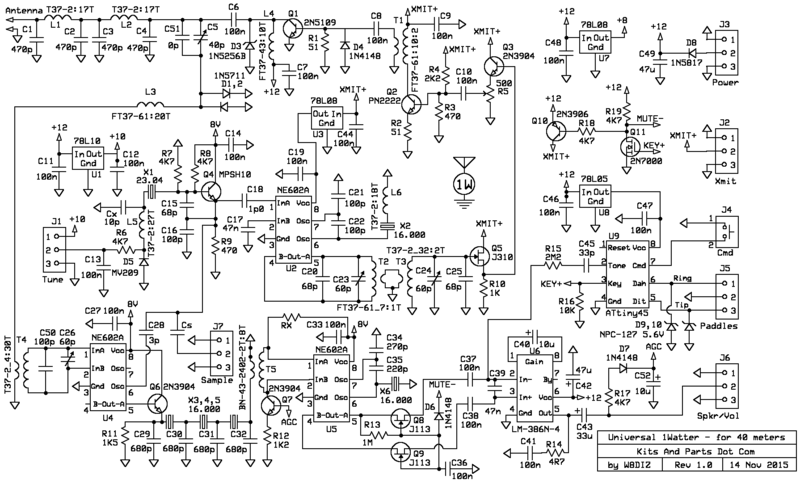 Nov 14 2015 0920 - On the schematic, C50 is a 100 pF capacitor. Nov 16 2015 1259 - The Natural Sidetone Mod improves the audio quality and accuracy of the transmit sidetone frequency. Perform this Mod after the 1Watter is built and tested. Replace R15 with a 1M resistor.